I brought home the bacon! Well, actually I brought home a couple of pounds of pork belly from the Flying Pigs farmstand at the Union Square market and turned it into bacon. I’n’t it purdy? It also tasted absolutely amazing. I used a really flavorful cure – with juniper, garlic, and other spices, and the meat was amazing: I never knew bacon could have this much flavor. Because the meat was so awesome, I put a lot of thought into coming up with recipes that would showcase its flavors rather than adding them as an extra – bacon is so often just a grace note in a dish’s composition. I came up with two dishes: one for brunch and one for snacktime. The first dish is based on a classic combo: bacon and Brussels sprouts. This pairing usually stars sprouts, however, and throws in a few crispy bacon bits to round things out. I upped the bacon ratio – to about 2 parts bacon to 3 parts chopped sprouts – and cooked it in large chunky lardon form, with a little shallot to round things out. As Michael Ruhlman recommends, I blanched my lardons before cooking them; I then took a cue from Italian cooking and used my nice salty blanching water as cooking liquid for the sprouts, the same way I’d use salted pasta water in a light sauce. Bacon and sprouts, though, are just a side dish. I wanted my bacon to be a star! A real contender! So, I thought, why not add an eggy element. In fact, why not add…a popover! If you have not had popovers, you must try them now: they’re eggy, light, easy, and yummy. And they’re an amazing vehicle for many sweet and savory fillings (like bacon and sprouts). In fact, to be honest, they’re really just Yorkshire puddings in Southern belle drag. But they do it so well. I first had popovers in Maine at the lovely Jordan Pond House in Acadia National Park; they always make me think of sunshine and of the amazing summers I spent on Mount Desert Island with my friend C.
I actually made two batches of this – one with bacon and one vegan, without bacon; I used vegan Earth Balance margarine for both and it worked great! Super Bowl Snack Touchdown! 1. Preheat oven to 450 degrees. Butter a muffin tin and put it in the oven to heat. 2. Whisk flour and salt together. Beat the eggs in a separate medium bowl until they lighten a little, then whisk in half the milk. 3. Gradually mix the flour in with a wooden spoon, then add the rest of the milk. Don’t use a whisk; the batter may be a little lumpy. 4. Pour the batter into the heated muffin tin; each cup should be about two-thirds full. 5. Bake in the center of the oven for 15 minutes. Without opening the oven, lower the heat to 350 degrees and bake for another 20 minutes until the popovers are golden brown. Serve piping hot! 1. Blanch the lardons for 1 minute in simmering water. Drain the bacon and reserve about 1/2 c. water. 2. Heat a skillet on a medium flame and add the shallot. Sautee until it starts to turn translucent, then add the bacon. Fry the bacon until it just starts to brown on the edges. 3. Add the sprouts and cook until they start to caramelize a little. Add the reserved blanching water and braise until the sprouts are tender. Season to taste and serve in the middle of steaming popovers. 1. Pop the popcorn and let it cool in a large roasting pan. Preheat the oven to 250 degrees. 2. Cook the bacon in a nonstick skillet over medium-high heat; when it starts to brown a little, sprinkle with the 2 tbsp. brown sugar and cook until crispy and candied. Set aside on a plate; do NOT try to drain it on a paper towel. 3. Melt the butter in a medium saucepan, and add the molasses, the corn syrup, and the remaining 2 c. brown sugar, and cook over medium heat, stirring sparingly, until the mixture starts to boil. Keep cooking until the sugar mix reaches the soft ball stage. Remove the pan from the heat and stir in the salt, baking soda, and vanilla; the mixture will fizz a little. 4. Pour the caramel over the popcorn, sprinkle peanuts and bacon over the top, and turn gently with a silicone spatula or wooden spoon until the caramel is evenly distributed and the popcorn is coated as well as possible. 5. Bake for 15 minutes in the preheated oven; flip the popcorn and redistribute the popcorn, then bake for another 20 minutes. Cool for about 5 minutes, then transfer to a parchment-lined baking sheet and cool for 15 more minutes. 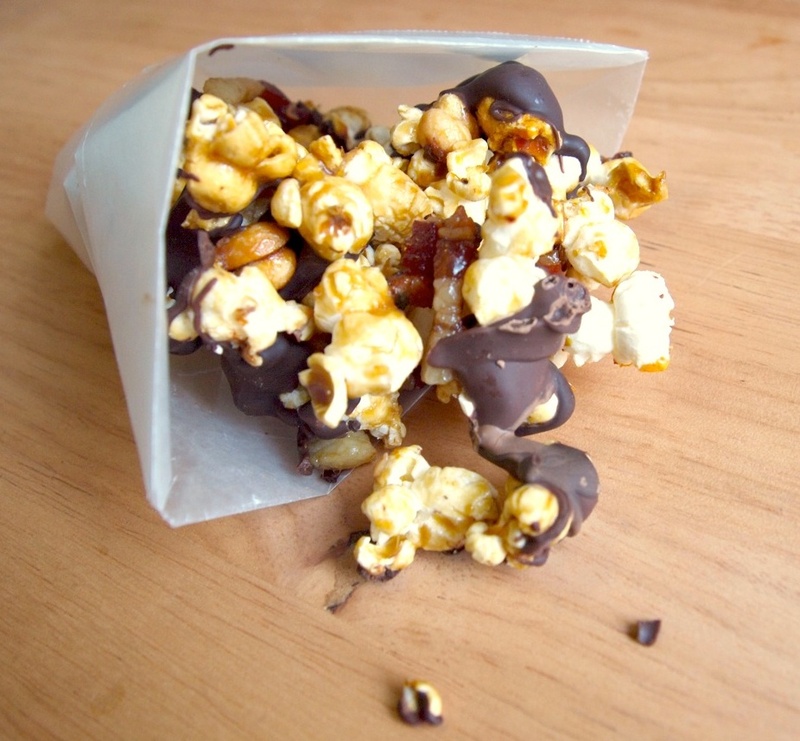 Drizzle attractively with the chocolate; let the chocolate set before breaking the popcorn into pieces. It will keep in an airtight container for up to a week. **The gents at Baked say we should temper the chocolate. If you feel like doing this, go for it and your popcorn will be extra-pretty. I was too strapped for time, but my plain old melted chocolate worked pretty darn well! That looks so great! I really love those popovers with the brussel sprouts, I would never have thought to do that but they look awesome! Wow..that looks delicious! Awesome photos! You drew me in with the cracker jack, but everything here is so amazing! I’m loving these charcutepalooza posts! Oh, sweet jesus on rollerskates. I HAVE to make this. So much deliciousness on one page! We made bacon caramel corn this Christmas and it was the best decision ever so I know how you feel! Oh my that bacon just looks like heaven. My husband would be licking the screen. 😉 The cracker jack is probably the best version I have ever seen….instantly addicting. Holy yumminess…That cracker jack sounds incredible! I’m also drooling over your bacon. Great job! I’m envious of your bacon stash!!! one can never, ever have too many bacon, and your post is testament to that…look at how well it transforms into different treats! That’s just absolutely amazing! I love the idea of the “cracker jacks on crack!” :-p I’m definitely digging that instead of regular ‘ol popcorn. May have to make a batch and smuggle it in to our next movie theater romp! :-p Thanks for the inspiration!! OMG cracker jacks with bacon. That is decadent! Cool. 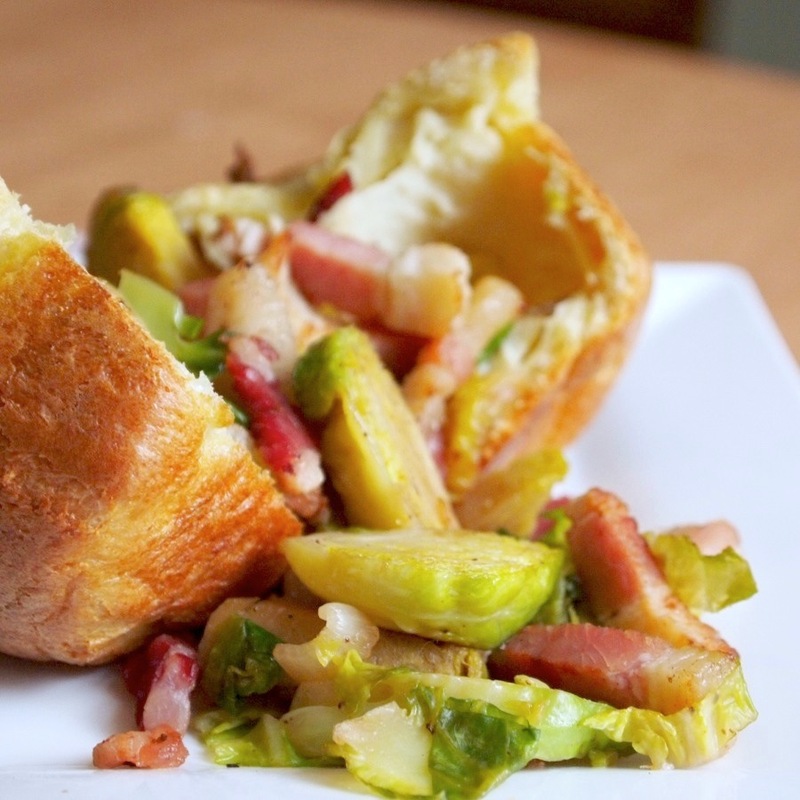 I love the bacon creativity….heard of it with brussels sprouts but never would have thought to serve with popovers….yum! 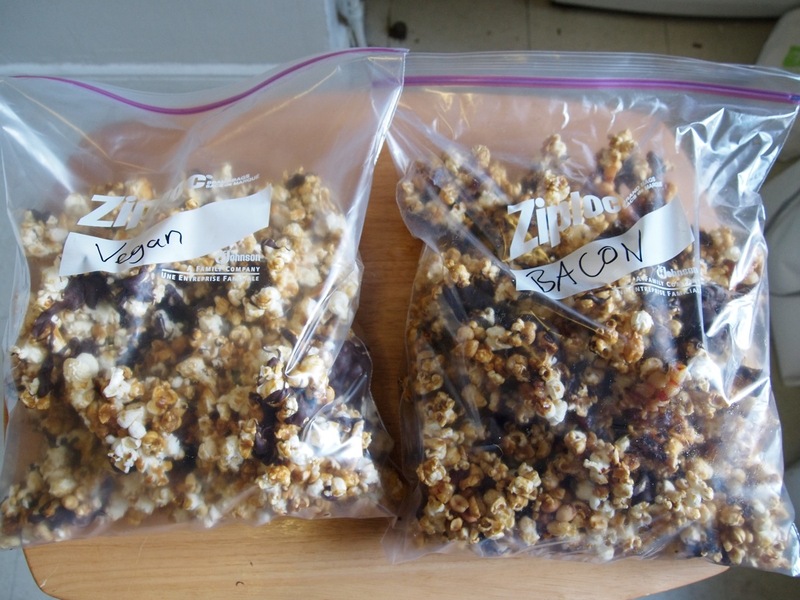 popcorn/chocolate/bacon… mmm, i know some people in my family that would love to try some! Another Top 9…you are on a roll. This is amazing…great job! My husband loves popovers and is always looking for an excuse to bake them. We are totally going to make these! I saw the sprouts and said bingo. I’m making a pork dish from Bon Appetit and have been wondering what to make as a side with it. 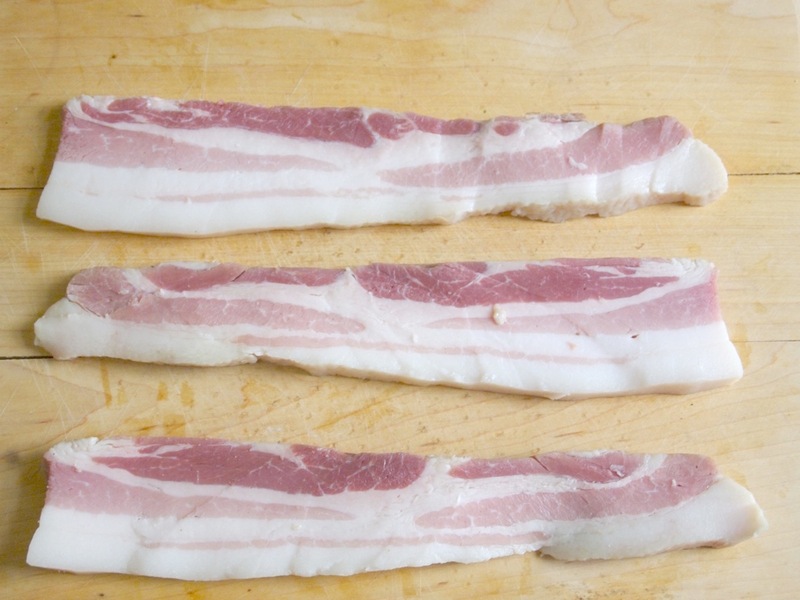 I don’t have your absolutely gorgeous bacon, but i do have some and so will be making your Bacon-Sprout Saute. I’ll let you know how it goes. Many thanks for helping to provide our dinner for tonight! Beautiful post! I love the popover idea – I will have to start making these STAT! As promised, I made your sprout dish with dinner and have mentioned it (as well as linked back to you) on my post. Hope you check it out. Thanks again for the recipe! Popovers are soo delicious and soo much fun to eat! Your crackers jacks with chocolate and candied bacon sounds incredible! oh yea i uberly adore BACON!